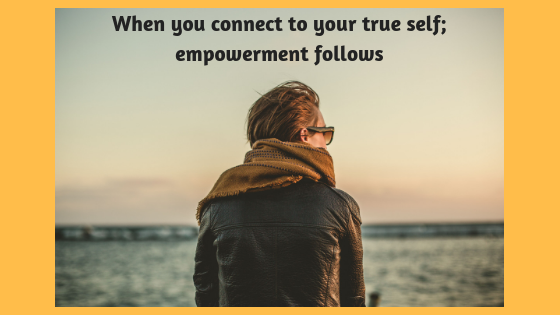 Being and living an empowered life means being connected to your true self all the time. Not when you’re just at home alone. Its being connected to your inner self in any environment and being present. I have a friend that I work with. She is really smart, talented, and has a lot of experience in her field. But she complains that she cannot be herself at work. She says she has to “put on” for work. One day she said out loud in frustration “ I just want to be myself…all the time…ugh”. This made me think about how many others live life like this. Many may do it for their job, their family, their spouse or boyfriend, friends. But what’s the point? If you are not living as your true self then technically you are not really here. You are not present in all the moments that are happening in your life because you are being someone else. You can’t truly enjoy moments because your mind and emotions are trying to balance out the version of you that is being displayed at that moment and version of you that is really you. This gets hard, tiring and it doesn’t prove anything except that you’re wasting everyone’s time, especially your own. This is where stress, frustration and comparison start to play a part because when you aren’t connected to your true self you always feel in competition. Even with the smallest things – you feel it’s a competition. But the competition is not on the outside, it’s all internal in the thought process. See, none of your friends, coworkers or neighbors sit down at night and contemplate how to compete with you. People are not making blue prints on how to beat you at the game of life. No one does that. It’s in our minds that we believe this because we were taught at some point that our true self was not good enough. Think about that for a minute, no one is waking up every day to worry about how they can compete with you. It’s in our thoughts! Why is it in our thoughts? Because you have down played your talents, told yourself you can’t measure up so you will settle for this, uplifted others instead of uplifting yourself, analyze and problem solved every scenario to help everybody else until you’re tired, and you haven’t invested time, energy and money into nurturing your own natural talents. This is one way the belief gets formed that “I can’t be my true self because …..”(finish that sentence with whatever you tell yourself). How would anything but stress and frustration come from this type thinking?! Another way this belief gets formed is due to our upbringing. If you came from a religious background, strict parents, over protective parents, detached family, abusive family or lack of family then you may have been influenced in your formative years to downplay certain behaviors, talents, or your whole damn personality. The corrections of behavior that came from influential family members were likely done when you were being your true self. As a youngster that’s all you know . At 3,4,5, or 8, years old you react, respond and think honestly in honor of your true self. But when someone shut that behavior down you took it as a truth. And when you corrected this behavior and didn’t repeat it you were acknowledged, praised, given hugs, not talked about, and not judged. This was the payoff. The only problem with this is that internal second guessing takes over and it never goes away. After awhile it becomes the standard, you don’t even notice it anymore. You constantly second guess yourself out of habit. How do you get back to your true self without feeling guilty or ashamed about it. First understand that this happens with everyone not just you. Second, you meditate. Mediation can be done in many forms, prayer, taking a walk, listening to music, connecting with positive soul centered individuals. This is that friend, family member or coworker that just gets it. They don’t judge, they listen, they are genuine and they are always working on bettering themselves, they walk the walk and talk the talk. That is a soul centered individual. Coloring, drawing, writing, yoga, dancing, and sitting in quiet are also forms of meditation. Mediation is one of my favorite activities. It takes time to master but the payoffs are amazing. I started off meditating for 3 minutes to a guided meditation. I remember that 3 minutes was like eternity for me. I was so in my head all the time and sitting still for 3 minutes not being distracted with something else was difficult. But as time went on my time increased, now I’m up to 30 minutes twice a day. Writing is also a therapeutic way to release and reconnect to your true self. I have special journals that I keep just for writing. Writing doesn’t have to make sense, it doesn’t have to be grammatically correct, and it doesn’t have to be shared. It’s for you and unless you are willing to share your writing, no one else needs to see it. It’s also a great way to connect to your creativity. You would be surprised at the aha moments you will stumble upon while writing. There have been a many of days when I literally do a brain dump on a blank page. There’s no flow, no rhythm, no periods, no sentences, just words on words on words pouring out like garbage. And in a sense it is garbage. It is every thought stuck in your head that keeps going round and round. Once you empty the garbage everything starts to look better. You don’t need to do all of these activities, just one that resonates with you. Whatever peaks your interest or one that you’re drawn to, that’s the one to focus on. If you still aren’t sure try all of the activities until you find one that speaks to you. When you start doing any one of these activities you will notice a spark goes off inside of you. Like a little spark of electricity or excitement, it’s small but meaningful. That is a sign you are connecting to your true self, your spirit. That is when you begin to feel empowered. Feeling empowered affects your state of mind and how you experience the world around you. When you get into the habit of doing these types of activities you will start to feel comfortable being alone, more relaxed in your day to day life, more confident in your abilities and more in tune with your higher power. Empowerment is found when you are connected to your true self. There is power within you that is unique to only you. There is no competition because there is no one else like you. You can’t compete with an original. Can you recall a time when you were connected to your true self? Did you feel confident? Were you working toward any goals, if so what were these goals?